The Squidge Elf books are the creation of Andrew Thomas. As well as the books, Andrew has been creating themed reading ‘events’, delivered to schools electronically and free of charge. The aim of the packs is to encourage reading through funny and engaging stories and to promote broader literacy using related exercises and games. We also provide free themed activities for kids and parents at home, to accompany the Squidge e-books. 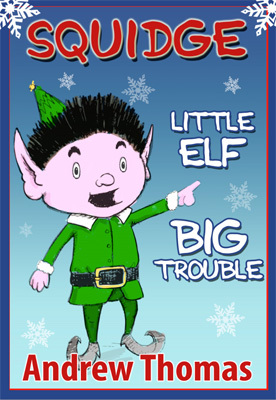 Squidge: Little Elf, Big Trouble is the first in a series of books written by Andrew Thomas. It has has been downloaded worldwide, enjoying a top ten spot in the Amazon US free chart and most recently it was number one in the US Christmas children’s eBook chart. Who ever heard of an elf saving Christmas? Squidge is a little elf who wants to do what the bigger elves do. When he takes matters into his own hands and causes a disaster in Santa’s workshop, Squidge runs away… and ends up going further than he would ever have dreamt. Can such a little elf save Santa and Christmas? 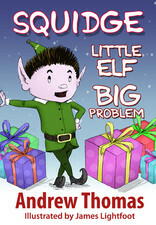 Squidge: Little Elf, Big Problem is the second book in the series. It is currently in the top ten of the children’s free chart on iBooks. What do you buy Santa for his birthday? Squidge is a little elf who wants to do what the bigger elves do. When he realises that he only has one day left until Santa’s birthday. Squidge has to hurry to find a gift, but what do you buy for someone who gives presents to all the boys and girls of the world? Squidge has to run… but will he be in time. Can such a little elf solve such a big problem?